Traditional navigation techniques using map, compass, altimeters and other navigational tools are vital to safe recreation in the backcountry. But in the 21st century, the age of technology, there are extremely powerful, digital tools that supplement traditional practices. 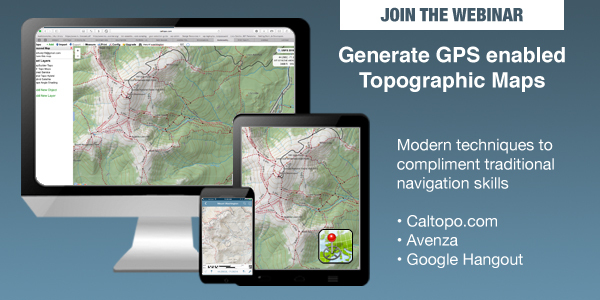 This webinar utilizes Caltopo.com, Avenza and Google Hangout to put you in the driver seat to building enhanced maps and unlocking new terrain. This three-part series will blow your mind and enable you to virtually transport to far away destinations, from the comfort of your home. Adding identifying markers, images, etc. A special thanks to Chauvin Guides International. Your expertise is unparalleled. Upon Registration, you will receive a confirmation email with necessary information regarding your upcoming webinar. On the day and time of the webinar, you will be invited to join the video call by the instructor. We ask that you be on standby to receive this call. Anyone who misses the invitation will have to reschedule their session.